...The sprawling mega-prison in the heart of GOTHAM CITY, home to it's most violent thugs and infamous super-villains. 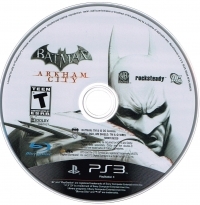 07-22-2013 Seikenfreak Box Text NO ESCAPE FROM ARKHAM CITY ...The sprawling mega-prison in the heart of GOTHAM CITY, home to it's most violent thugs and infamous super-villains. With the lives of innocent civilians at stake, only one man can save them and bring justice to the streets: BATMAN. 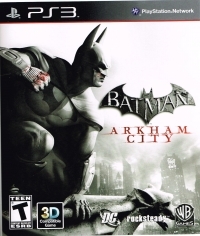 08-07-2012 mkarasch Description The sequal to Batman: Arkham Asylum takes us forward in time, when Dr. Hugo Strange has convinced the city of Gotham to wall off a large portion of the city to use as a prison city. He also frames Bruce Wayne, and conveniently gets him thrown in there as well. This is a more "sandbox" style game, with many side missions and extra things to do. 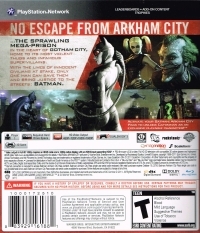 08-07-2012 mkarasch Box Text NO ESCAPE FROM ARKHAM CITY ...The sprawling mega-prison in the heart of GOTHAM CITY, home to it's most violent thugs and infamous super-villains. With the lives of innocent civilians at stake, only one man can save them and bring justice to the streets: BATMAN.